For a tutorial on my anniversary makeup click HERE. It's been pretty quiet around this blog these past couple of days, I know it's pretty uncommon for me not to post at least every other day, but this was a busy weekend! This past Friday August 15th was my hubby and my five year wedding anniversary! We have been together for a total of 11 years this October and have celebrated five wonderful years of marriage. My husband is a closet romantic so he took it upon himself to plan our entire anniversary date...I didn't know anything about it! All I knew was that we were leaving at 2:30 in the afternoon and wouldn't be home until about midnight! So I got ready for this surprise date, my mother-in-law came to watch our daughter, and off we went! I had no idea where we were going so I was quiet surprised when we approached LAX. My hubby told me we were going on a plane trip...I didn't believe him, and I was right not to since we drove passed the airport. He thought he tricked me. So we kept on driving for a total of an hour and forty-five minutes, all the while I had no idea where we were going! Eventually we parked in the Laguna Beach Harbor, and I was SO confused. We walked onto the doc and came to a boat that was tide up. It turns out it was a glass bottom boat that my hubby had completely rented out!! We had our own private tour of the Laguna Beach harbor, and got to see all the fish and seals that live in the harbor, we even got to feed some of the fish! After our hour tour on the boat, we eventually went back to the pier. We then got back into the car and drove some more. We eventually came to The Chart House, the exact restaurant we ate at on the night he proposed!! It is a beautiful restaurant that is right on the beach! We had a quiet corner table right next to the window, not too far from the table we ate at on the night he proposed. We had an amazing dinner right on the beach and where able to watch the sun set behind the ocean while we had our dessert...so romantic. Once we were done eating I thought our night was over, but my amazing hubby had one more surprise in store for me. We drove for another fifteen minutes or so until we made it to the Long Beach Laugh Factory! I was SO excited, the Laugh Factory in LA is one of our favorite date night locations so I was so excited to try a new location. We had a blast! The comics were hilarious and it was a perfect end to our amazing night! I am simply amazed at what a wonderful date my love put together completely by himself, and he kept it a complete surprise! The rest of the weekend was full of family time. It was really nice to be able to have some down time with just the three of us. We hung out at home, went shopping, Charles and Isabella had some great father daughter time, and we just spent the weekend building wonderful family memories. One of the things we did this weekend was some shopping!! We made a quick stop at our local Lush store (as quick as you can make a Lush stop) and got some great goodies. 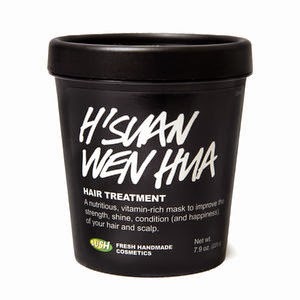 One of the things I bought was the Lush H'Suan Wen Hua hair treatment. It is my FAVORITE hair treatment ever! It's so moisturizing but doesn't leave your hair feeling heavy. The main reason why I got it was because Isabella has been taking swimming lessons all summer, and the chlorine from the pool has dried out her hair a little bit. We have never cut her hair in her entire 3 1/2 years and my husband is dead set on not doing it, so I wanted to try this out to help repair her hair. Her hair isn't too bad, you can't tell it's dry from looking and barely from touching it, but since I do her hair every day, I can definitely tell there is a change. So on Sunday night we had a little mommy/daughter spa time and put our hair masks in. Isabella was SO excited to be able to do a "mommy thing" and she loved the hair mask so much, she said it "tickled" as I put it on. I really soaked her hair, especially her ends and then put her hair up in a clip and then wrapped her hair in a plastic shopping bag (ghetto I know, but you gotta do what you gotta do). I then let the mask sit in her hair for about half an hour, and then washed it out during her regular bath and let it air dry as she slept. Oh my goodness you guys, I already see such a difference! I can barely feel the dryness in her ends any more. I think I need to do another treatment this weekend and then her hair will be back to normal! I am so thankful it worked because I didn't want to cut off her baby hair, and I REALLY didn't want to break it to her daddy that we needed to trim her hair. I think he would have cried, she has him wrapped around her finger I swear! !